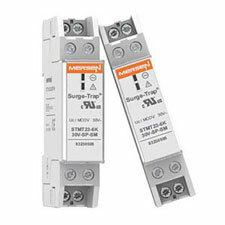 NEWBURYPORT, MA (FEBRUARY 2019) - Mersen is pleased to announce UL 1449 Certification to its Low Voltage Surge Protective Devices, the Surge Trap® STMT series. UL 1449 4th Edition Type 4 Component Assemblies, these SPDs are ideal for protecting controls, power supplies, communication systems, and other sensitive equipment. With a slim design, these DIN-rail mount SPDs are a great choice for limited space applications. The series is suitable for operating voltages of 12-230 VAC and 24-365 VDC and offers an optional dry contact feature for remote monitoring. For more information about the STMT Series, visit the STMT product page. For more information about Mersen Electrical Power, visit ep.mersen.com.